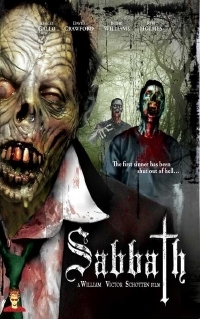 Yes I'm a sucker for low budget zombie horror, especially the likes of Zombie Planet, Noctem, Day X, and many others, and this looks like it will be no exception. This is another from Brain Damage Films who did Awaken the Dead which I didn't care for, but it does have some promise, as long as they keep the mtv video feel out of it. Read on for synopsis and trailer. "When the last soul enters heaven and the first sinner is shut out of hell life as we know it will cease to exist. Geller runs for her life from the bloodthirsty zombies that seem to have over run her small town. For help during end times she turns to Mack (a criminal), two shady brothers and a faithless Reverend played by David Crawford (DAWN OF THE DEAD 78). Geller and her new friends are on the run from roving hoards of zombies, shadow demons and the Grim Reaper!"